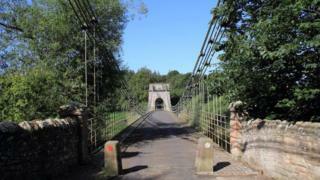 Scottish Borders Council's scrutiny committee has endorsed a £1m contribution towards an upgrade of the Union Chain Bridge. However, it called for greater transparency and co-operation over the funding package for the project. The committee was called in to review a decision to increase the council's commitment by £450,000. The money will be used towards an overall £7.8m scheme to overhaul the bridge linking Scotland and England. The Union Chain Bridge - built in 1820 - crosses the River Tweed from Fishwick in Berwickshire to Horncliffe in Northumberland. SBC had agreed to raise its support to £1m but Hawick councillor David Paterson succeeded in having the matter called in due to concerns over value for money. It has now decided that that decision should stand. Stuart Bell, who chairs the committee, said: "The council's scrutiny committee has examined the recommendations of the executive and come to the conclusion that the application to the Heritage Lottery Fund that is proposed should go ahead." He said a recommendation would be added that approval should be subject to all other funding being in place. Mr Bell said better governance would also be sought along with "better co-operation and co-working" with Northumberland County Council.